MNP Churn Numbers: Vodafone gains & BSNL falters! MNP has been implemented – now its time for a reality check for all the telecom service providers. Good boys will be rewarded and bad boys will be punished. And, for a change, the verdict would come from none other than the king (the customer!) himself. The initial churn reports with respect to subscribers willing to avail of MNP to switch operators are fast emerging on the horizon. Though, most of such reports are limited to the Haryana circle where MNP was implemented way back in November 2010; analysts are of the opinion that the trend could be more or less similar across the country. While the initial estimates suggest that hardly 140,000 subscribers, or 0.75%, opted for MNP to ditch their current mobile operators; a Swayam-numvar survey indicates that 58% of the subscribers are more than willing to log on to telcos that provide better services. 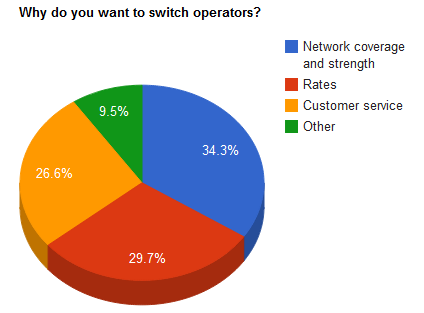 Network coverage (34%) and tariff rates (30%) emerged as the top 2 reasons as to why respondents want to avail of MNP while retaining their number. Well, that’s about survey findings. Let’s get back to ground reality. The early set of numbers from Haryana provides that BSNL and Reliance Communications have emerged as biggest losers in the race of poaching subscribers led by MNP. While the state-owned operator has net lost 20,503 subscribers, the Anil Ambani-led Reliance group finds itself short of a net 13711 subscribers (GSM+CDMA). In MNP, one’s loss is other’s gain! The subscriber loss recorded by BSNL, Reliance and Idea has proved to be a welcome business opportunity for Vodafone (20,748), Airtel (7,434) and even the late entrant Aircel which net gained by 9,329 subscribers. For Tatas, the CDMA business has been a net loser. However, its GSM business – Tata Docomo – which has pioneered innovative marketing strategy in Indian telecom market – has been a great leveller for the group under its competitive DoCoMo brand. What’s more? As the craze for poaching customers sizzle-up, telcos have also started to waive-off MNP port-in charges of Rs. 19 as an extra incentive to the new customers. "MNP Churn Numbers: Vodafone gains & BSNL falters! ", 5 out of 5 based on 1 ratings. Products Made-for-India: The new Trend ! Campus Placements: MNCs beat Indian IT Biggies! MNP Effect. There are lot of blogs, and few forums users info is Airtel in going to loose many, and same in Reliance and BSNL. But in conventional Print News or in some reports the Data and News given is Airtel “ALSO” a big gainer. But actual gainers are Docomo and Vodafone. Airtel is definitely going to lose a lot of its existing customers, i have faced a lot of issues with it and am definitely going to dump it. However its also going to add a lot of new customers due to the positive image it has. 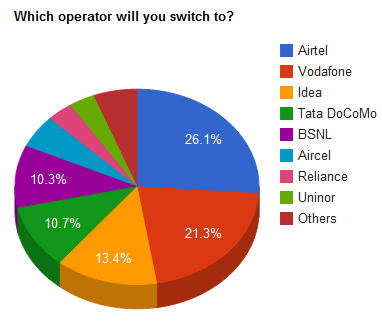 The article posed by you was an interesting read, however, the percentage of people wishing to switch to Airtel or Vodafone surprised me. This to me seems to be the power of advertisements. I have been a consistent user of both Airtel and Reliance since last 4 years, and according to me Reliance scores over Airtel in all parameters, be it be the network coverage while on roaming, tariff rates, quality of service and promotion free service. I wonder how can one be fooled by advertisers to such an extent. Nice to know your views. But, from the data that I am able to collect is Reliance is met poor response all over — be it survey findings or actual initial reports coming out. Ad, Vodafone is the best place to be with; better than even the No.1 player Airtel. vodofone & airtel will top the chart from mnp. (All over India).